Seattle is slated to break ground soon on a streetcar line running along First Avenue. 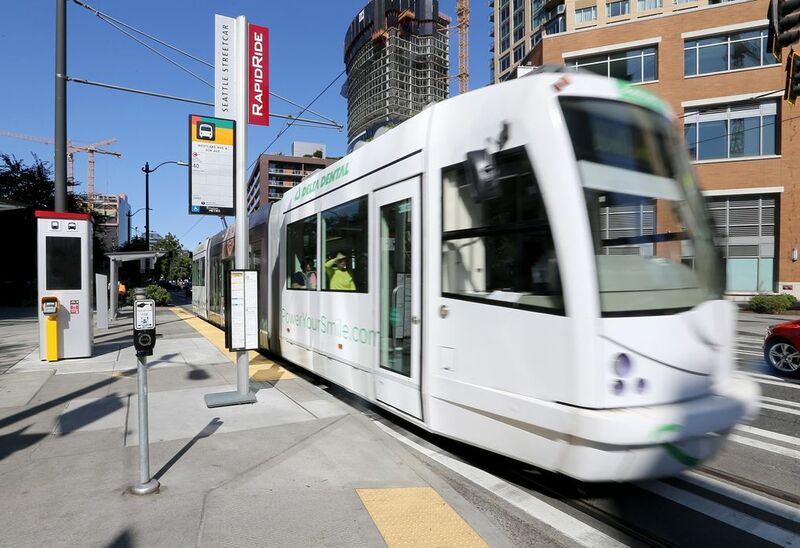 Officials say it will provide a crucial link through downtown, but streetcar lines aren’t meeting projections, and critics say the city’s assumptions aren’t realistic. Your fares cover about 40 percent of operating costs for Sound Transit’s Link light rail. Fares cover about 31 percent of the cost of King County Metro buses. Seattle’s two streetcar lines cover 23 percent of their costs with fares. But once a streetcar is built along First Avenue in downtown Seattle, the city Department of Transportation (SDOT) expects fares to cover a whopping 56 percent of operating costs for the three lines. That would be among the highest rates of any transit agency in the country. 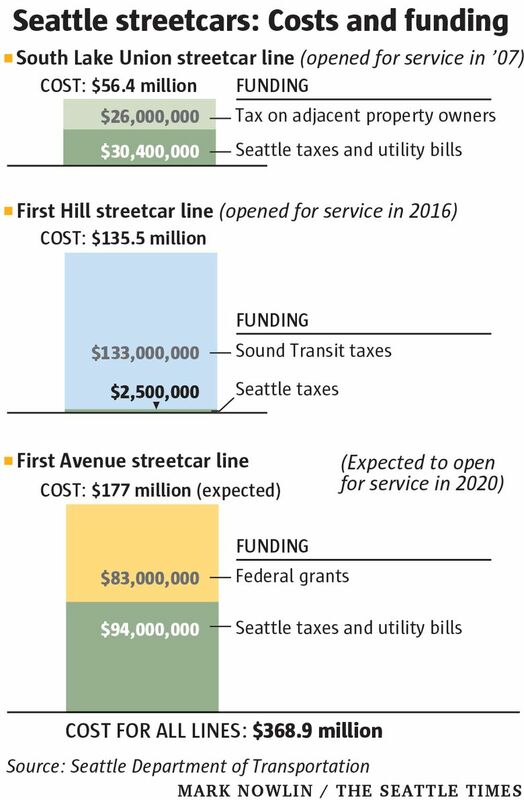 And it’s one of a number of optimistic financial projections contained in Seattle’s plans to expand a streetcar system that is performing far below expectations. Early next month the city will break ground on the $177 million, 1.2-mile Center City Connector line that will run along First Avenue. 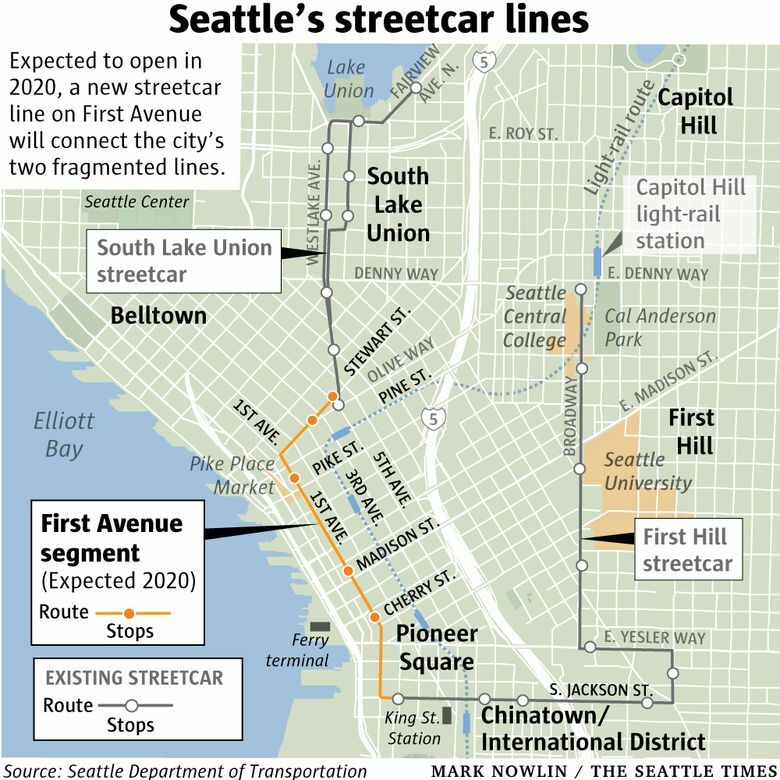 When complete — its scheduled opening is 2020 — it will link the city’s two fragmented streetcar lines and connect South Lake Union with downtown and the Chinatown-International District before looping around like a bobby pin to reach First Hill and Capitol Hill. The city anticipates $83 million from the federal government to help pay for the project, $58 million of which has been approved by Congress. The remaining $94 million will come from local taxes and utility bills. Previous reports listing the cost at about $152 million did not include the costs of public water and electric utility work. The new rail lines will run from McGraw Square, at the south end of Westlake Avenue, along Stewart Street and First Avenue, to South Jackson Street. The majority of the line will run in streetcar-only lanes in the center of First Avenue. To make room, 194 parking spots, mostly used in off-peak hours, will be removed. Once the system is complete, however, it will run in mixed traffic at both edges, having to contend with traffic snarls around Mercer Street, the International District and on Broadway. Through most of South Lake Union, downtown and the International District, trains should run every five minutes, while in Little Saigon, First Hill and Capitol Hill trains should run every 10 minutes. The city admits that the streetcar lines are underperforming, but officials say there is demand for an easy-to-understand streetcar that would link neighborhoods in Seattle’s booming downtown. The two streetcar lines — South Lake Union and First Hill — have low ridership that the city doesn’t expect to improve until the First Avenue line is built. But once it is built? The city predicts an exponential surge. 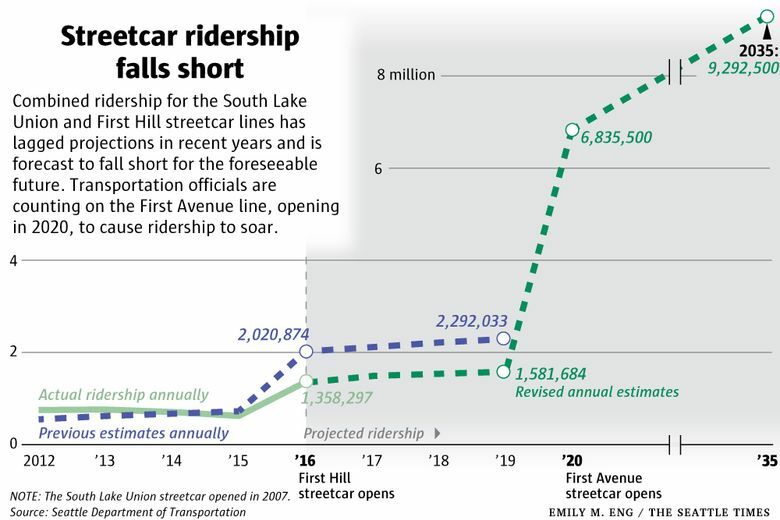 So far this year, the city’s two streetcar lines have averaged about 5,200 riders per weekday, if you filter out 2½ weeks in the spring that the First Hill line was shut because of an uncontrolled skid. Those numbers, for the two lines combined, equate to about the 25th-most-popular bus line in King County. SDOT predicts that in its first year of service, the expanded streetcar system will more than quadruple its ridership — to nearly 22,000 weekday riders. By 2035, SDOT predicts almost 30,000 weekday riders, a nearly 470 percent increase over today’s numbers. Either ridership prediction would make the streetcar far more popular than the county’s most-used bus line. With more than 11 million square feet of office space scheduled to open in downtown Seattle in the next 3½ years, the baseline conditions for such projections are in place. But past projections for ridership have missed the mark. After exceeding its targets in the early years of this decade, the South Lake Union streetcar saw a dip in ridership in 2014 and has not recovered. It projects to fall well below previous forecasts through the rest of the decade. The much-delayed First Hill streetcar opened last year and fell more than 30 percent below ridership projections in its first year. SDOT doesn’t expect it to come close to its original projections until the new line is built. SDOT’s ridership projections are crucial for determining whether the streetcars will be able to sustain themselves and their estimated $16 million annual operating costs. In an advisory memo to City Council members earlier this year, two staff analysts wrote with veiled incredulity about SDOT’s streetcar assumptions. Covering 56 percent of operating costs with fare revenues would be “extraordinary,” the analysts wrote. SDOT officials say their ridership model is the gold standard — used by the Federal Transit Administration to validate other agencies’ models. SDOT is also relying on $5 million a year from Sound Transit to help fund streetcar operations. But that money, part of the makeup deal for First Hill not getting a light-rail stop, is guaranteed only through 2023. If fare revenues come in below estimates or Sound Transit’s largesse ends as scheduled, the city would need to find other funding sources to run the streetcars. City Council staff “continues to believe there is financial risk in the Center City Streetcar financial plan,” Chow wrote in another memo in June, adding that much of that risk was also inherent in the streetcar system. Development tool or useful transit? Ridership on the South Lake Union streetcar began to decline in 2014, as traffic worsened in the neighborhood, before tanking in 2015 and 2016. Not coincidentally, the streetcar’s reliability dipped at the same time. Streetcars were on time 89 percent of the time in 2013, but 77 percent of the time in 2015 and 58 percent of the time in 2016. In early 2016, SDOT made changes, making the streetcar’s lanes on Westlake Avenue “transit only.” Those changes gave a boost to transit service, but are also feeding the streetcar’s woes. Sharing the streetcar’s lanes are two of the city’s most-used bus lines, the C and the 40, both with expanded service. 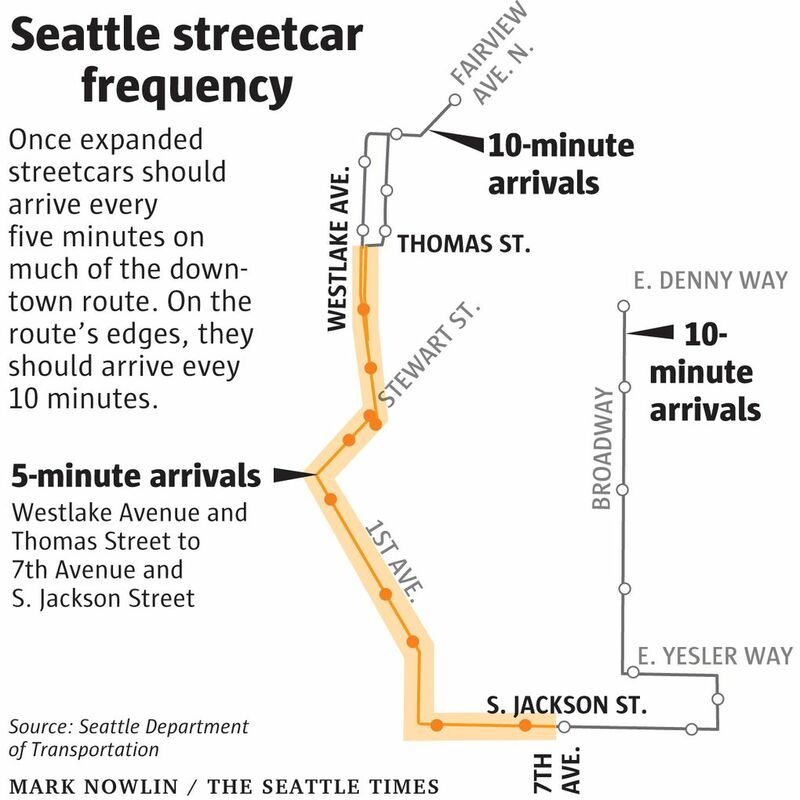 Why, many transit users realized, should they ride the streetcar, which runs barely 1 mile, when buses come four times as often, cover the same stretch as quickly and also extend their routes to West Seattle and Ballard? Westlake Avenue is a microcosm of the arguments made by streetcar skeptics nationwide, who question their utility if they are not separate from other traffic. “If you build a streetcar instead of a good bus line, that money you spend above the cost of the bus line is not helping anyone get anywhere faster,” Jarrett Walker, a Portland-based transit consultant, wrote in 2009. Bus lines are almost always cheaper to build than streetcar lines and they’re also less expensive to operate. It costs King County Metro about $163 an hour to operate a bus, according to federal data, while a South Lake Union streetcar costs $242 an hour, although a streetcar can carry 30 to 40 more people than a double bus. What streetcars offer is a simple, clear route, attractive to people — notably tourists and visitors — who are unfamiliar with the mazelike bus system. “It’s a strong, direct, legible connection between these downtown neighborhoods,” said Ben Franz-Knight, executive director of the Pike Place Market, citing the benefits of an easy link between South Lake Union, the Market and the stadiums. There’s been a streetcar renaissance in recent years, with lines sprouting up across the country. 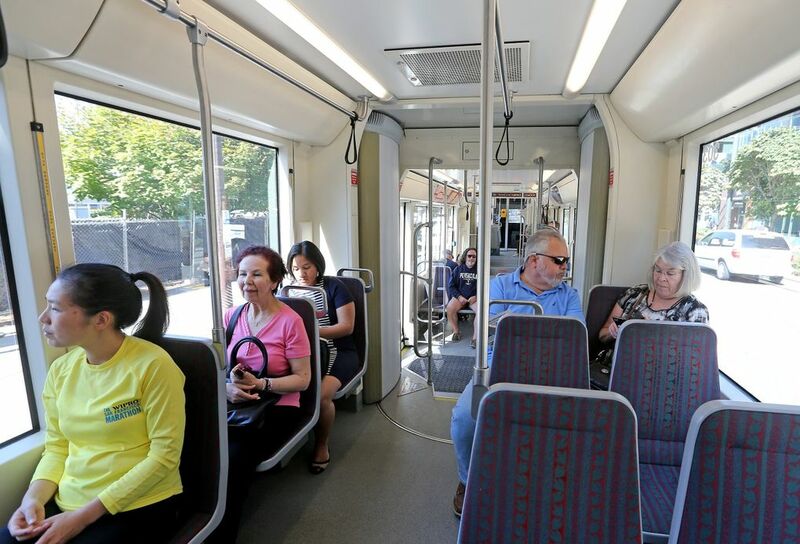 At the same time, a few cities — notably Arlington, Va.; Providence, R.I., and San Antonio, Texas — have backed away from streetcar plans and invested instead in RapidRide-type bus routes. More often than not, streetcars are pitched as economic-development tools, to help revive flagging neighborhoods, rather than as a way to move people quickly through a city. That was the case in Washington, D.C., where SDOT director Scott Kubly previously worked and was known informally as the “Streetcar Czar.” That city’s grand plans for a streetcar network have stalled at one line. And it was initially the case in Seattle. The South Lake Union streetcar — half funded by property owners in the area — opened in 2007 after Paul Allen’s Vulcan development firm pushed it as a way to help turn the warehouse-filled neighborhood into a biotech hub. Then the city got the First Hill line almost by accident. It was a consolation prize after Sound Transit concluded that putting a light-rail station there would be too costly. Having those streetcars already in place is the best reason for building the line to connect them, SDOT officials say. And the motivation to build has flipped: The new streetcar isn’t being looked at as an economic-development tool. Downtown is overflowing with economic development.